The Kuala Lumpur International Airport (KLIA) (IATA: KUL, ICAO: WMKK) is the main gateway to Malaysia. 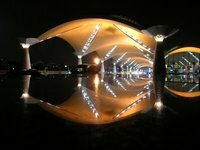 Completed and opened in 1998 in conjunction with the 16th Commonwealth Games, this airport is situated about 50 kilometres south of the capital city Kuala Lumpur. It replaced the old one at Subang Jaya, a suburban area about 20 kilometres south west of the city centre. The single-runway airport has since then been renamed as Subang Airport (officially Sultan Abdul Aziz Shah Airport) (IATA: SZB, ICAO: WMSA) and is now serving private jets and airlines operating turbo-prop aircraft. There are two terminals at the international airport: Main Terminal and Terminal 2. Terminal 2, being branded by the airport operator as 'klia2', was opened in May 2014, and serves mainly budget airlines. For more information about other airports around the world, see also the list of airports. KLIA Express is a dedicated high-speed rail service which travels between the airport and the City Air Terminal at KL Sentral in the city centre in just 28 minutes (or 33 minutes to/from Terminal 2). A single trip ticket costs RM35. From KL Sentral, there are Light Rail Transit (LRT) (metro), inter-city rail, monorail, buses and taxis available to take you to your destination. Operating hours are from 05:00 to 01:00. Trains run on frequencies of 15 to 20 minutes. The bus ride to the city takes one hour under normal traffic condition, longer during rush hours. Most airport buses go to KL Sentral, a public transportation hub in the city centre. There are also a few bus operators servicing major hotels in the city and other nearby towns outside Kuala Lumpur. Bus fare to the city centre typically costs about RM10 for a single trip journey. Taxis come in several types of services, ranging from luxury 'limo' to regular metered taxis. There is also van-size taxi, capable of carrying eight passengers, for travelling families and large groups. It is very important that you specify clearly the type of service you want when you purchase the coupon to prevent yourself from being sold a more expensive taxi service coupon. Travelling time by taxi to the city centre is one hour under normal traffic condition. If you're driving, simply follow the road signs to your destination. Top speed limit on most parts of the expressways is 110 km/h and reduced to 80 to 90 km/h as you get nearer to the city. Roads in the city have speed limits of between 50 and 80 km/h. If you are heading towards Kuala Lumpur city centre, the expressway route (as indicated on the yellow, hexagon-shape shield) is the shortest route to drive on. This is an automated driverless people-mover train that ferries international flight passengers between the Main Terminal Building and the Satellite Terminal A.
Travelators are available in all four wings in the Satellite Terminal A, the two Contact-Piers in the Main Terminal Building, and on the skybridge to the carpark and Sama-sama Hotel. Bus service is available every 15 minutes to ferry passengers between the Main Terminal and Terminal 2. The KLIA Express train connects both the Main Terminal and Terminal 2. A single trip fare is RM2 for adult, RM1 for child aged 2 to 12 years old. The journey takes only 3 minutes, but a train departs every 15 to 20 minutes (04:55 to 24:00) or every 30 minutes (00:00 to 01:00). This airport is the home base of Malaysia Airlines, AirAsia and AirAsia X. Some major carriers flying into KLIA are Air China, Cathay Pacific, China Airlines, China Eastern Airlines, China Southern Airlines, EgyptAir, Emirates, Etihad Airways, Japan Airlines, KLM, Korean Air, Lufthansa, Oman Air, Singapore Airlines, Thai Airways. In total, over 50 airlines serve Kuala Lumpur International Airport, with flights to almost all continents. Major destinations include Sydney, Tokyo, London, Paris, Amsterdam, Johannesburg, Shanghai Pudong International Airport, Los Angeles, Dubai and Delhi. The Main Terminal Building (MTB) houses all the airlines check-in counters and administrative offices. There is a contact pier connected to the building for all domestic flights and a few international flights. The Satellite Terminal A is the terminal for international flights only. It is connected to the MTB by a people-mover train service called Aerotrain to move passengers between the two buildings. Terminal 2, branded by the airport operator as klia2, serves budget airlines. All AirAsia and AirAsia X flights operate from this terminal. Other airlines serving this terminal are Cebu Pacific to Manila and Tiger Airways to Singapore. If you're on a transit flight of more than five hours during the day, you may want to do a quick tour around the Kuala Lumpur city centre. Showcase KL is a great way to catch a quick glimpse of the vibrant capital city. This tour can be purchased at the Satellite Terminal Building. Duty-free shopping in the Main Terminal and Terminal 2 are located after the immigration control. Sandwiched between the Terminal 2 building and the passenger drop-off is gateway@klia2, an integrated mall-within-an-airport complex. Shops span over four levels, targeting not just flyers, but meeters and greeters as well. If you're on transit from a long flight and wish to freshen up yourself, there are gym, sauna and shower facilities available at the Sama-Sama Express Hotel in Satellite Terminal A. There is a pharmacy and a 24-hour clinic each in both the Main Terminal and the Satellite Terminal if you are feeling unwell or require medication (over-the-counter or prescription). 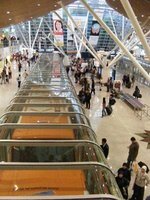 Terminal Buildings – For those who are backpacking, on a tight budget and do not mind sleeping in the waiting area, it is safe to do so. Seats with no arm–rests (some even with no back–support – great for sleeping) are available in all terminal buildings. 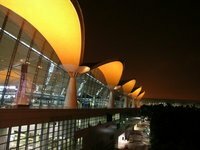 The terminals can turn very quiet late at night so it's good for sleeping, but the air con can also turn really cold at that time. Sama-Sama Express KLIA – Located next to Gate C5 inside the Satellite Terminal A (international flights), this hotel offers rooms, gym, sauna and also shower facilities for those who are on a brief stopover. Concorde Inn KLIA – This hotel is located just outside the terminal building and is only 3 minutes away via a complimentary airport transfer. Sama-Sama Hotel KLIA – This 5–star hotel is linked via a skybridge to the adjacent Main Terminal Building (MTB). It takes only 5 minutes to walk from the MTB to the hotel. Tune Hotel klia2 – This new hotel is located within a 10-minute walk (covered walkway) from the Terminal 2 building. Free wi-fi access is available in all terminal buildings. Some cafés and restaurants also provide internet-ready computers for their patrons. Payphones which accept both coins and credit cards are available throughout the terminal buildings. The post office is located in the Departure Hall at the Main Terminal Building. It is open between 08:30 and 17:00, from Monday to Saturday. It is closed on Sundays and public holidays. This is version 36. Last edited at 13:34 on Sep 28, 17 by omanair17. 10 articles link to this page.